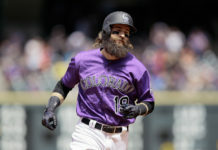 Walks have been a killer in the four losses the Colorado Rockies have suffered through the first nine games of the MLB season. 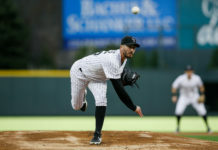 Colorado pitchers surrendered 22 total bases on balls and two hit by pitches in the four losses that had them 4-4 entering Saturday’s game against the Atlanta Braves. The Braves, however, are one of the few teams in the National League that has issued more free passes than Colorado on the young season. The end result of the 3-2 contest should have come as no surprise, then. After the Braves rallied against new Rockies closer Wade Davis with a game-tying run in the ninth inning, Atlanta closer Arodys Vizcaino issued three walks (one intentional) that ultimately cost him the game. Carlos Gonzalez scored the game-winning run for the Rockies, reaching base via a one-out double. Ian Desmond struck out swinging for the second out of the inning, making the three walks that followed all the more painful for the Braves. Vizcaino intentionally put Gerardo Parra on first base to face Trevor Story, who ranks third in the National League with 13 strikeouts. Story worked his fourth walk of the season, though, refusing to bite on three straight sliders Vizcaino issued after jumping ahead of Story 1-2. Vizcaino then issued four straight balls to Tony Wolters to bring Gonzalez home and send Colorado home a winner. Story’s at-bat, Rockies Manager Bud Black suggested postgame, offered clear signs that Wolters wouldn’t need to swing the bat to deliver a victory. 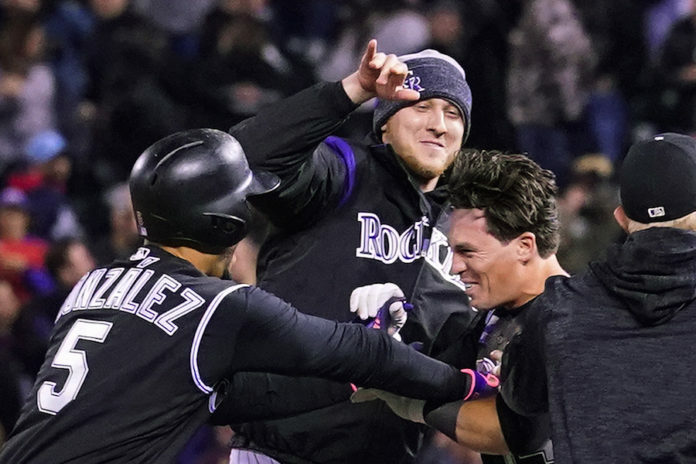 “After CarGo got the base hit and then we got to Trevor, you could see — after the intentional walk — you could see their pitcher was losing it just a little bit,” Black said. “You know, he spiked some breaking balls; he missed with pretty wide margins around the plate. So, I think that sort of led Trev to really eyeball the pitcher. I think after [Story] walked that was sort of set up for Tony to be a little more selective, too. With seven walks allowed in the game, Atlanta moved into first place in the NL for most issued with 46. Colorado allowed four, including one by Wade Davis in his first blown save in five tries. Colorado now ranks fourth in the NL with their 38. The Rockies are also tied for third with Milwaukee and Miami with their five batters hit by pitch allowed. The Rockies and Braves wrap up their three-game series on Sunday at 1:10 p.m. MDT. Kyle Freeland, who walked two hitters (but struck out six) in a loss to the Padres in his first start, will be on the mound for Colorado. Sean Newcombe, who walked four in a loss to Washington in his first start, will pitch for Atlanta.